When Western science was introduced to modern China, more translated words were used to express fundamental concepts and terms than borrowed words. The process of academic translation, commensuration, and communication between Western and Chinese philosophy is a process of comparative philosophical research. Nowadays, however, it seems that Chinese philosophy is evaluated by a Western Hegelian criterion. This leads to the debate over whether or not China has philosophy. But it is meaningless to argue about whether or not China has the name of philosophy. 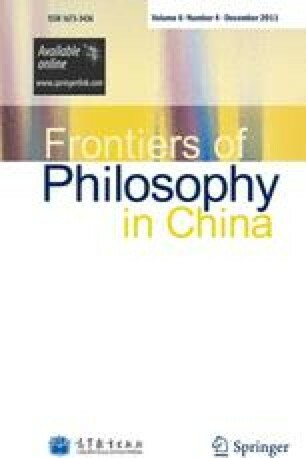 The key issue is whether or not China has the actuality of philosophy. Looking at the history of Western philosophy, it seems that the Hegelian definition of philosophy was the only one that existed in Europe. However, during the last 200 years after Hegel that the two main philosophical trends of positivism (scientism) and irrationalism developed from anti-Hegelianism or “Spurning Metaphysics.” As metaphysics is being reconstructed, the ghost of Hegel has reappeared. It is clear that in the future, philosophy will evolve from the development of human metaphysics or cultural philosophy. It is a process of the “negation of negation”: from traditional metaphysics to the spurning of metaphysics, and then to human metaphysics.